It’s Kings landed; the teaser trailer for Game of Thrones‘ final season is here and spreading on the World Wide Web like wildfire. Fans were treated to the most tantalising teaser – which lasted mere seconds – on the night of the Golden Globe Awards, and were left in greedy anticipation for more… Until last night. Titled Crypts of Winterfell, this official teaser takes us on a deep dive into – you guessed it – the Crypts of Winterfell. An ominous start, you’ll agree, as we enter the final stages of the TV franchise, and the gang prepare for The Great War. Even more so for the Stark clan if these Reddit theories are to be believed – no spoilers, I swear. 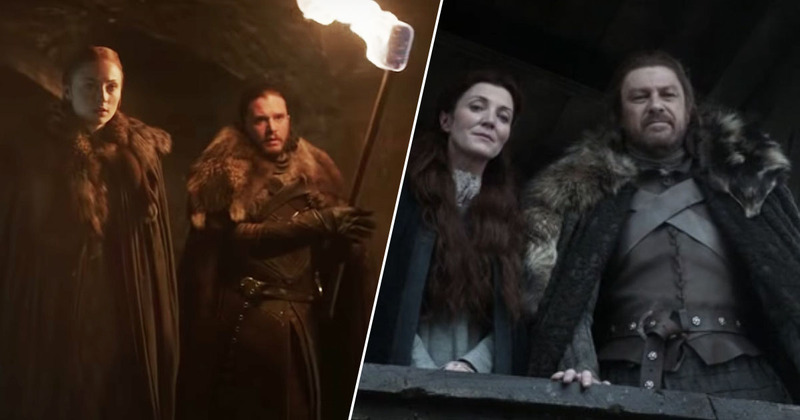 The trailer sees Jon Snow, Sansa Stark and Arya Stark walk the lengths of the gloomy crypt, haunted by voiceovers echoing their now-deceased parents from seasons past. They meet in a morbid reunion and come face-to-face with their own statues. Symbols of their mortality, perhaps? Or the impending doom which awaits all who play the Game of Thrones. And Redditors have noticed there’s a bit of discrepancy in the apparent ages of said statues. They’ve put two and two together, and deduced what age the characters are set to die accordingly. For example, they say Jon Snow’s statue looks much older than those depicting Sansa and Arya, so people think he’ll live into old age, but the Stark women will be slain before their time. One agreed but thought others might be reading a bit too much into the statues, joking ‘the Ned statue wasn’t an accurate’ likeness ‘while the Catelyn [statue, was] so it ‘seems Stark statue makers may just be better at female likeness’. This was addressed. It’s mainly because Ned’s body was never sent back to Winterfell so the statue maker just had to make a statue from memory. Perhaps this explains why Arya and Sansa’s statues have been crafted in the likeness at a young age. Maybe they’ve gone to live long and happy lives in the Citadel? And in the end he’s waking up from being knocked unconscious from falling off the tower? The entire series was bran’s dream and he convinces his dad to stay in Winterfell, where they all live happily ever after with their direwolf pups….